This year just seems to be flying by! I can't believe that spring has arrived and we're only a few days away from Easter, but I sure am glad. Church. We were at church every Sunday morning (and every other time the doors were open) but Easter Sunday was a special time because we were specifically celebrating my Savior's resurrection! The biggest, itchiest Easter dress that you can imagine complete with crinoline, hat, gloves, tights, purse, and matching shoes. Let me give you a little background...my Granny Janice had 4 sons. Her first grandchild was my brother, the Mater Hater, and then I arrived 3 years later. Granny was so excited to have a little girl and was determined to make me a prissy little lady. Bless her heart, she didn't get what she wanted. She must have forgotten that I was going to be surrounded by all of those uncles and an older brother. I was and am what you would call a tomboy. I hated dresses then and I'm still not crazy about them today. But, Granny got to dress me up like a little doll on two holidays: Easter and Christmas. Easter dinner at Granny and Pa's house. There would be ham, green beans, mashed potatoes, corn, deviled eggs, macaroni and cheese (my favorite), and several different desserts to choose from. We would eat until we couldn't hold another bite and then end up in the backyard under the trees where we would tell stories, laugh, and have a great time. Watching The Ten Commandments. To this day, there hasn't been an Easter that I haven't watched this movie. I honestly can't imagine an Easter without it. 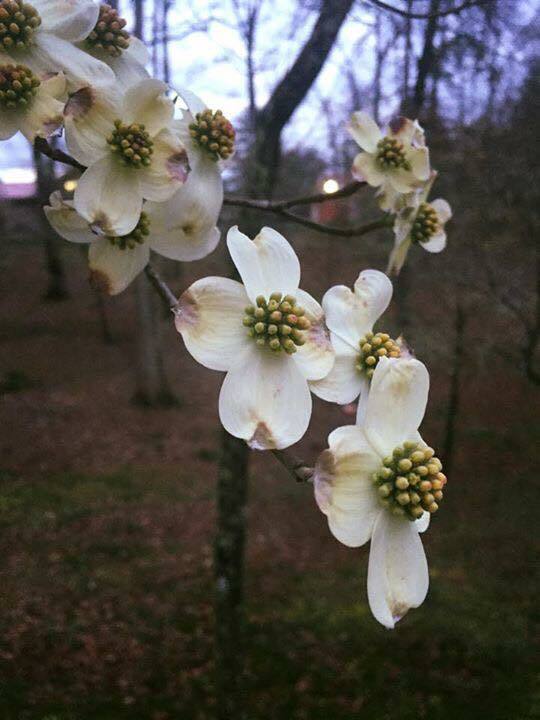 Dogwood blooms. Dogwood trees are a big part of the landscape of Appalachia and they're one of my favorite trees. Their blossoms happen to be NC's state flower. I can't look at one without thinking of my mom. They were also her favorite tree and she painted the blossoms in many of her paintings. She passed away in April around the time that all the trees are in bloom. Seeing them always makes me think of her. I remember her telling me about the legend of the Dogwood tree. 'Twas strong and firm, its branches interwoven. What was Easter like for you growing up? Have you ever heard the legend of the Dogwood tree?